It happens every once in a while. A European nation, not normally recognised as one of the continent’s big players, produces a group of individuals that offer the chance of real international elevation for a few years before drifting back to the wilderness. Consider Hagi’s Romania and perhaps Stoichkov’s Bulgaria as semi-recent examples. Football moves in cycles, and in amongst the clubs and countries currently residing in the doldrums and wastelands of the good game, lie a group that are rebooting their whole set up, gearing a brighter future. Getting it right isn’t always easy. You can get the structure in place, employ the right people in the right jobs, but if the talent just isn’t there, then you have a problem. For Belgium, talent has never really been an issue, maintaining consistency though, has. Missing out on five of seven World Cups prior to1982, the Diables Rouges were present in the final stages of the Spanish version and at each of the subsequent five tournaments. 1986 proved a high water mark as Belgium made the semi-finals only to suffer at the hands of Maradona’s Argentina, and the red devils were hugely unlucky to lose out to David Platt’s late, late winner against England at Italia 90. With the backbone of a side that, at various stages, included Ceulemans, Gerets, Pfaff, Preud’homme, Wilmots and the enigmatic Scifo, Belgium could be relied upon to get there, without necessarily ripping up any trees. With qualification for only one of the last seven European Championships occurring due to their status as hosts, and with the disappointment of missing out on two consecutive World Cups fresh in the mind, it must be time for that cycle to spin back round in Belgium’s’ favour. And it has. In very big fashion. Usually a country can rely on producing two or three very good players in one go, for Belgium, the jackpot has been truly hit with a group that has the potential to outstrip any others in the history of the country’s national football team. Lukaku, Benetke and Mirallas as forwards still have work to do to master their position, but the prospect of midfield support arriving from Hazard, Witsel, De Bruyne, Dembélé, Chadli and Fellaini eases the burden of goalscoring duties somewhat. So just an attack minded team then? Not at all. Consider that defensive ranks are bolstered by such excellent players as Alderweireld, Vermaelen, Kompany and Vertonghen, you can see why excitement is high in Brussels and beyond. And remember, all this is before we’ve considered a strong group of even younger players, with the excellent Dennis Praet at the centre of things. And so we come to goalkeepers. A weakness here perhaps? Not at all, in fact there may be an argument to suggest that this might just turn out to be the strongest position of all. While Simon Mignolet has received praise for his development at Sunderland, the long term prospects of a rapidly improving goalkeeper remain in the shadow of one of Europe’s finest custodians, still just 20 years old. Incredibly tall, but with breathtaking agility, Thibaut Courtois managed fourteen clean sheets during Genk’s 2010-11 title winning season. Whilst a strong defence made a difference, there were times when the young keeper was positively outstanding. If nerves were present, they were never on display. Playing to that standard is going to attract attention, and as part of their current remit to secure some of the world’s best young footballers, London club Chelsea confirmed Courtois’ signature on a five year contract in July 2011. 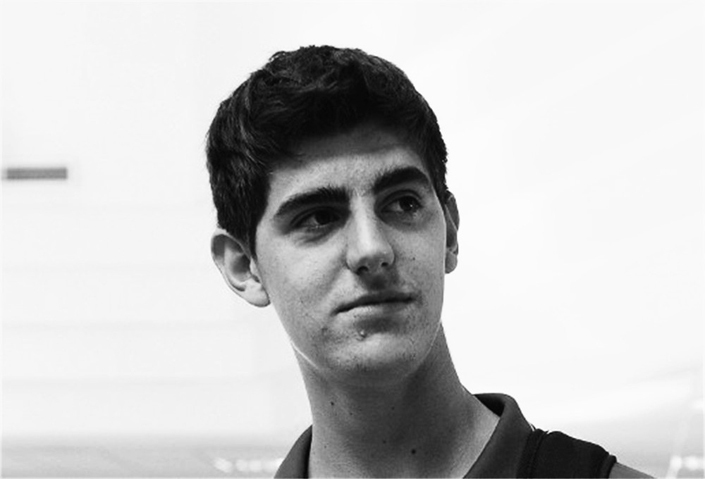 With the ink still wet on said document, Chelsea confirmed that Courtois would not be joining their first team squad immediately, but would instead move on loan to Madrid to replace the departing David De Gea at Atlético. Unquestionably, De Gea, a popular figure at the Vicente Calderón, would be a hard act to follow, but while Radamel Falcao was doing his thing at one end, Courtois has continued to keep his team in the running at the other. Now something of a veteran with more than sixty games for Los Colchoneros, Courtois has picked up exactly where he left off with Genk. A league title in Belgium was followed by Europa League success with Atlético. While many will suggest that the current purple patch being enjoyed in the red and white part of Madrid is almost entirely down to a certain Colombian goalscoring machine, the input of colleagues, and his colleague in goal in particular should not be overlooked. At time of writing, Atlético have one of the best defences in the Primera División, and have conceded fewer goals then Barcelona. All the more impressive when you consider that five of the thirteen goals that have passed were notched in high scoring victories over Rayo Vallecano and Betis, with Courtois not even featuring in the latter. Right now there are few, if any goalkeepers playing as well as the Bree born youngster. Brilliant at capturing the high the balls and those pesky in/outswinging crosses, Courtois can also deal comfortably with the low stuff too. Gets down well, gets up well. It’s very apparent as to why Chelsea sent goalkeeping coach Christophe Lollichon to Belgium to see a potential signing performing well, and if he still makes the trip to Spain, the subsequent reports will continue to gush accordingly. Over the next ten years, there may turn out to be better goalkeepers in World football, but right now, we know who our money is on. B Wow. Remind us, at what age do goalkeepers peak?